This is very preliminary. While it’s true I’ve both produced and reproduced these results, it’s still very early to draw significant conclusions, which I detail further below. This does not constitute medical advice. I realize many may read this and act on it, but I urge you to consult with your doctor and/or trusted medical professional — particularly if you are diabetic or insulin resistant. To illustrate this, I’ll be using this simple graphic to show a sliding scale from left to right as 100% carbs & 0% fat to 0% carbs & 100% fat. 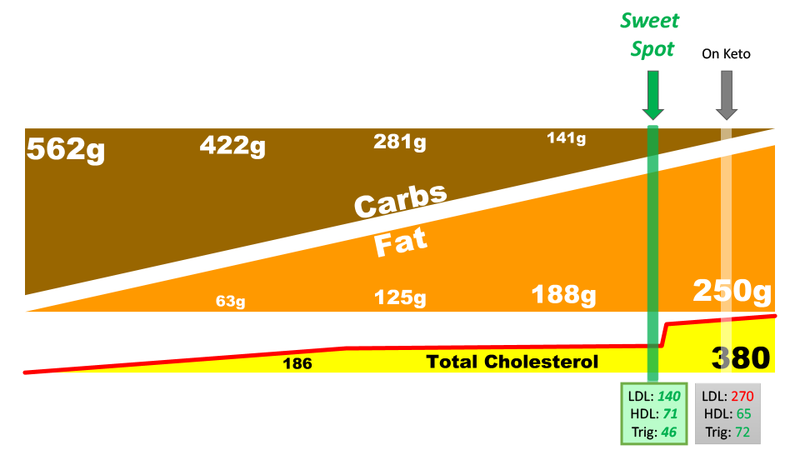 So let’s overlay the quantities of my carbs and fat both before and during the diet. Sure enough, after adopting this lifestyle, I felt better than I ever have before it. But then I got my cholesterol scores seven months after starting which showed an extraordinary jump in both total (TC) and LDL cholesterol (LDL-C). And this is where I learned I was one of the fraction of those going low carb who see a dramatic rise in total and LDL cholesterol known as a hyper-responder. To be sure, my HDL going higher is presumed good and my triglycerides going lower is presumed good. But the doctors care much more about LDL-C and will insist my higher levels on a low carb diet should be of great concern. Up to this point I’ve given the same advice to fellow hyper-responders as I’ve read from doctors and researchers: If you want the one surefire method for reducing your cholesterol, you will likely have to give up being low carb. 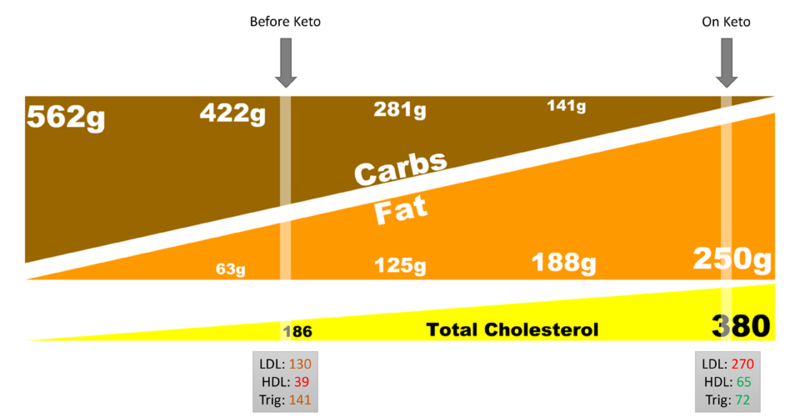 If we assume at least a rough linear relationship with fat and cholesterol, then I’d pretty much have to go almost entirely back to where I was before starting keto. 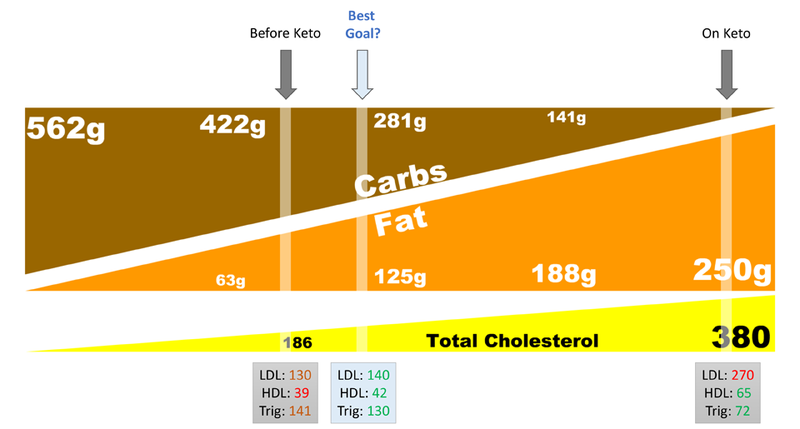 By some basic calculations, I could estimate a total cholesterol of around 200, LDL of 140, HDL of 42, and TG of 130 if I get back to about a 50/50 mix of carbs and fat (as shown by the “Best Goal?” overlay above). This makes perfect mechanistic sense, given how the lipid system works. If eating more fat means my body is trafficking more fatty acids for energy, then necessarily it must traffic more cholesterol in these same lipoproteins. As fat rises, so does Total, LDL and HDL, with Triglycerides falling. 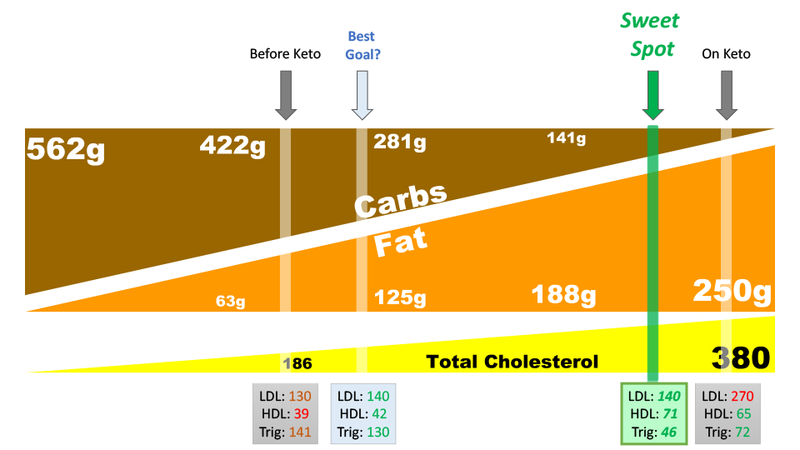 Total and LDL-C going up is supposedly bad (red), HDL going up and Triglycerides going down is supposedly good (green). Reversed, we see Total, LDL and HDL drop with Triglycerides rising. Total and LDL-C going down is supposedly good (green), HDL going down and Triglycerides going up is supposedly bad (red). So given this assumption, I expected my own data would likewise reveal this as well. When taking my blood tests, I’ll always have some variations of carbs, even if they are generally low. Moreover, I’ve had some variation in the ratio of carbs-to-fat. Yet while these were tiny shifts, there wasn’t a linear relationship appearing. I didn’t put too much thought into it until a series of recent experiments and what it revealed to me. Let’s revisit everything I’ve done to date, excluding only the “extreme” experiments (such as the Extreme Drop I did that spawned the protocol). 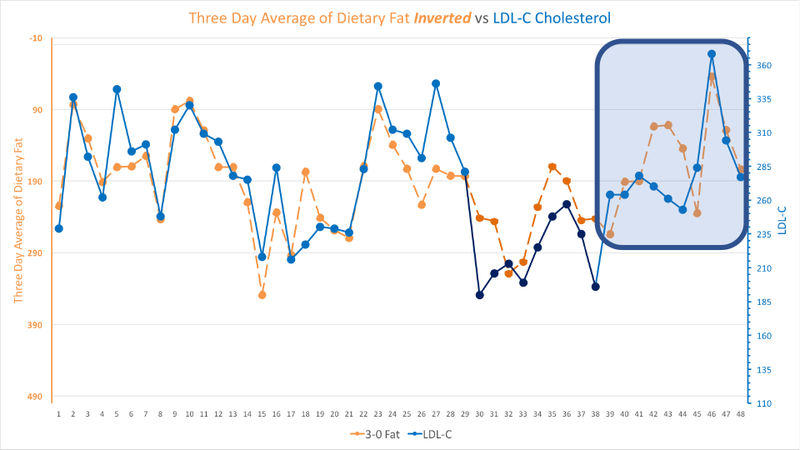 As usual, I’ll be flipping the left axis so you can better see the inverse relationship between three day dietary fat and LDL-C. Past this point, all graphs will have this same inversion with the left axis. Above, the darkened lines of orange and blue lines show where I did the distance running and thus lowered my LDL-C marginally. Just after that, I’m going to take the blue highlighted area at the far right and break it down further. From here, I’ll highlight each of the experiments I did over this period of time. This is further detailed on my Experiments List page. During first major experiment I had eaten only eggs and cheese for 10 days, changing the quantity in the middle. But unlike other experiments, I had moved it from a moderate quantity to a low quantity. This yielded a sustained gap like I hadn’t ever seen before in my series. I also felt general malaise; didn’t enjoy it much for the second half. But the big first clue came in the form of my fasting blood glucose being unusually correlative with my mood. Lower FBG = worse mood. 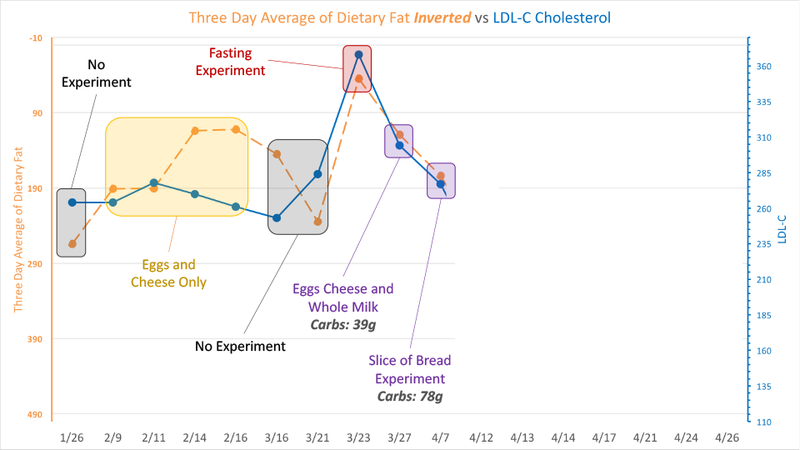 The second major experiment was with fasting, which I posted on recently. This too yielded a major clue given it coupled tightly as would otherwise be expected with LDL-C. The third clue came from the two experiments to follow. In the first, I had one cup (250 ml) of whole milk with each meal, in the second it was a single slice of bread. What astonished me was how tightly the Inversion Pattern held even going up to 78g of carbs / day. 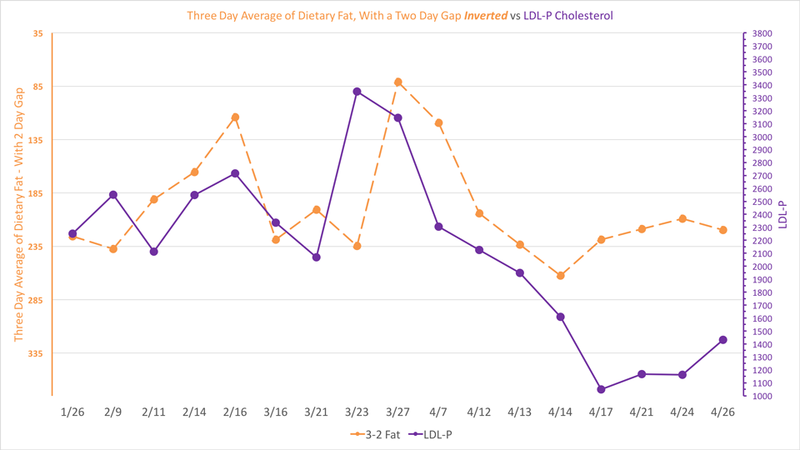 This proved the biggest clue of all as I’d have expected the gap between between the three day average and LDL-C to have widened. There’s a big part of this story I can’t fill in yet. It’s how each of these clues along with a theory I’ve been working on for a long time led me to the next major experiment. I’ll detail it in a future post once it has been tested against, which will take several more experiments to achieve. I’ll just say that the theory + these clues led me to calculate a range of 90 to 130g of carbs needed to hit this mythical “Sweet Spot”. With this calculation in hand, I wanted to devise an extremely controlled experiment. Indeed, this would be one of the most intensive I’ve ever done. I figured out I could achieve (1) by having a ketogenic meal replacement drink, and for (2) I would just have simple slices of bread. I managed to find one that was both 100 calories a slice and allowed me to get within the net carb range I was looking for at 5 slices a day. I would do five days of the shakes alone, then five days replacing 500 calories of the shakes with 500 calories of the bread. The first five days I’d be at around 30g of net carbs, with the second five at around 95g. This way I could really hit that target range while being extremely controlled on exactly what I ate. To further ensure control, I ate to a very specific schedule of 11am, 3pm, and 8am in all but the first two days. Before getting to what happened, it’s worth noting the data advantage I enjoy coming into this experiment. If you’ve been following my work for a while, you are already aware. But if you’re just joining us, you should know I’ve done 63 blood draws in 18 months and effectively have my own Inversion Pattern mapped now. So unlike anyone else I’m aware of, I’ll know when one or more variables are having an impact on my lipid system given the anticipated coupling you see in my graphs. Even in the outliers, there is little significant deviation from the mean, and until this graph below, no repeating patterns of a gap. 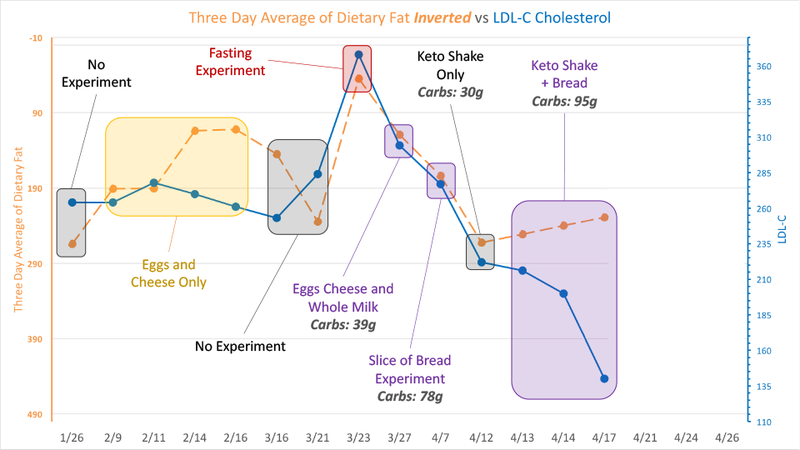 Below I highlight the blood test I took following the 5 days of keto shakes, which couples as we’d expect to the Inversion Pattern. Then, a clear gap forms between the higher expected LDL-C and the actual resulting LDL-C. In other words, swapping out 500 calories of the keto shake for 500 calories of the whole wheat bread resulted in a lower LDL cholesterol than we’d expect. Actually, there’s a huge number of differences here between the assumption above and this outcome. Let’s start with a closer look at the other lipid numbers. Not only was my total and LDL cholesterol the lowest I’ve ever had while on keto at 220 and 140, respectively — but my triglycerides were an impressively low 46, and my HDL was an extremely high at 71. Which is to say, this is the best looking cholesterol lab I’ve ever had. After getting this final lab test four days later on 4/21, I immediately had a blood draw and attempted to reproduce it. However, I ate my “normal” keto diet instead of the shakes, but while likewise adding the bread with each meal to target nearly the same macros as I had on the shake-based diet. Sure enough, the reproduction appeared to work as well. I ended up getting the particle count data late from the lab. There’s some analysis I’d have covered here regarding 3/23 and 4/7, but I’ll have to save that for a future post. 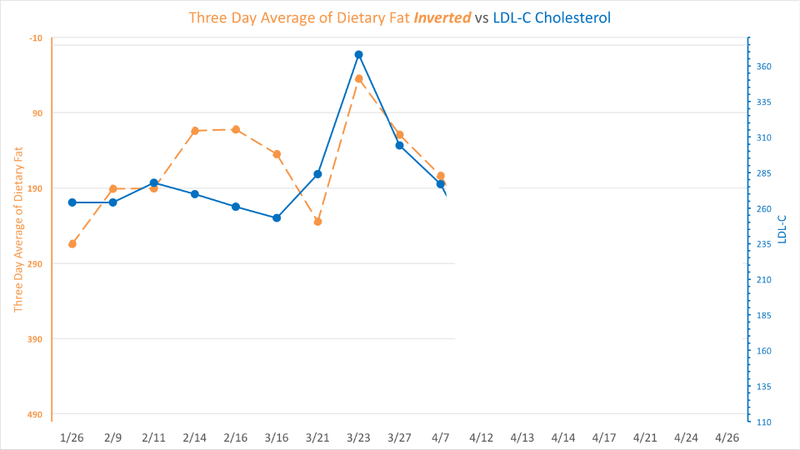 Like LDL-C above, LDL-P clearly shows the same divergence on its own inversion pattern (three days, with a two day gap). Let’s look to the relationship graphic we had above, but with the new results added. Clearly we can see only a small change in total dietary carbs got me the “Sweet Spot” I highlight above. But again — and this is important to emphasize — it didn’t appear until I passed a certain threshold. Remember, just before this experiment I had done another (“One Slice of Bread”) experiment where I averaged 78g of carbs with no diversion in the Inversion Pattern. In other words, this strongly suggests there is a threshold, a tipping point, a drop off with regard to my lipid numbers. That’s the reason I wanted to illustrate this analog relationship as I do above, because this strongly suggests it may be wrong. With this in mind, let’s revise the concept. Here I’m illustrating how the shape of this cholesterol relationship appears different. With a sudden drop off point, it implies I can get the best looking lipid numbers by getting to the other side of this threshold. Again, this is still very preliminary, but the testing so far supports it. None of these came as a surprise to me given the higher carbs save the fasting insulin, which I expected to be higher. This may be the start of a solution for hyper-responders who seek a better lipid profile, while still staying low carb. Instead of adding back hundred of daily carbs, I was able to stay just under 100g even if I was giving up ketosis. But again, I have a more distinct advantage than most due to knowing my own lipid patterns so well, so I can more easily identify where this carb threshold is and isolate it. As far as the theory that led me here, that will have to wait for a later post. However, while I’m happy if this may ultimately provide hyper-responders like myself with a new choice, not much has changed for me personally with regard to the risk assessment. I don’t know for sure that this lipid profile is a lower risk for all cause mortality today anymore than I would have a month ago. In short, I’m more interested in what this means on a system-wide level for the body’s regulation and control than I am for its personal impact on my life… at least, for now. I’ll be pausing for a little while as I ramp up some contract work to rebuild my research funds. Up to this point I’ve been paying for the last 18 months of blood, medical, and technology expenses from my savings — save a few generous contributions from individuals through my donate button on the site. Thanks for the support! I’m currently back to my “normal” keto ratio and expect to do another blood test following the pause to confirm my numbers have returned to the original Inversion Pattern. If so, we’ll know these changes were indeed transient. Following that, I plan to experiment with other sources of carbs (fructose, lactose again, etc) to determine if the ratios hold regardless of the type of sugar. 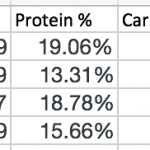 I’m also tempted to do more lopsided intake of carbs where the same general macros are hit, but with a single meal being carb-heavy where the others are generally keto. This is fascinating stuff, however . . . The assumption here has to do with having a total cholesterol and a LDL-C that is lower is better and that the standard cholesterol lab result targets are a good thing. Do we know this? Given that pretty much every other marker improves on a ketogenic diet, just maybe that rising total cholesterol and rising LDL-C is actually an improvement as well. Is there actually any research that shows anything detrimental about higher cholesterol and LDL-C numbers? Can we say with authority that raised LDL-C is definitely bad? Back to the other question: is it possible that those raised LDL-C numbers while you were on keto are a good result? I’d have to ask “the best looking cholesterol lab” according to who? Conventional medicine? If it turns out raised LDL-C is actually good, they don’t look like such a good set of results. What are the small, dense LDL particles are doing?.If they go up with a keto diet, that would be a concern. I’m curious: why the effort to make your lipid profile fit western medicine’s ideal? Are you certain it is the best thing for your health and longevity? So in many ways I’m more excited about what this means for my research in the overall lipid system than for personal risk until and/or if I develop markers that suggest otherwise. Danni, LDL-C used in this context I believe refers to LDL (calculated), not LDLc vs LDLp. As another hiper-responder, this is really interesting. I will have to test this out (my latest numbers are 2400 LDL-p and 1100 small LDL-p). Have you consider fiber as one of the reasons why increasing carbs using 500 cal of whole wheat toast reduces LDL-P so drastically? I’m actually very doubtful fiber played a significant role in this result. I’ve had many keto meals that were high in fiber, yet low in net carbs. And I haven’t seen much significant correlation. I only recently began following your blog, so might have missed some key details in the back traffic, but did do some searching. Overall, you appear to be rediscovering material that is known to the community of Dr. William Davis (cardiologist), and compiled in his former Track Your Plaque program (now named Cureality, and soon to be Undoctored). Knowing your ApoE status is part of the puzzle. Another couple of tests I don’t see discussed are Lp(a) status, and any calcium [Agatston] score (CT or EBT calcium scan; not a CT angiogram). Dr. Davis used to have specific advice for ApoE4 (and E2) clients, but it rather looks as if the diet and lifestyle program he now recommends for everyone brings things under control for all but the most intractable lipidemias: grain-free, very low net carb, ad-lib specific fats, remediate and maintain microbiome, 3 grams or more per day of Omega 3 DHA+EPA, no added Omega 6 Linoleic Acid, supplement Vitamin D and magnesium to titer target, plus some other strategies. Disclosure: I’m a contributor on Dr. Davis’ Wheat Belly Blog (where the topic of lipidemias, curiously, seldom arises). Interesting comment. Yes, I’ve read some of wheatbelly’s material. I’m an ApoE 3/4, my calcium score was actually assessed again last week at 0. My Lp(a) test last year was in normal range (don’t have that number handy). I’ll check into your link later, but you should know I’ve gotten very, very cozy with lipid numbers and the patterns they are exhibiting. For me, this is clearly an energy distribution system (see my breck presentation) and I’m not interested in lowering any lipid numbers (or raising them) without disentangling this part of the puzzle. Simplified, I believe there are good and/or bad reasons lipids are elevated, given they wear many hats. The *real* question is how you can distinguish between the two. Eating fish further down the food chain can help with the mercury. So smaller the better. Thats why sardines are my preferred fish and I’d avoid things like tuna & swordfish. Also with the smaller fish its no problem to eat the bones as well because they are small so extra nutrients we rarely get there as well. Keep up the good work. That’s great advice — I’ll be sure to try that out. The latest program summary would be the book Undoctored, just released this week. Davis, by the way, basically put himself out of the interventional cardiac business because his patient population simply stopped having events. I saw that. Tip for your readers on that: the $99 23andMe Ancestry test provides the same Raw Data download as the full $200 test, and it’s easy to extract ApoE status from the two SNPs involved. Anyway, my understanding is that some E4s might need to fine tune fats, if the markers that matter aren’t brought into comfortable bounds by the basic Davis program. Excellent. That’s generally considered to be a 5 year warranty of near-zero likelihood of events. A CT CAC can often be had pretty cheaply ($99 around here, no referral required), as hospitals use it as a loss-leader to recruit patients for the major procedure funnel. Anyone concerned about heart disease might consider getting a scan as a baseline. Take the number, but politely decline the advice. Beware of proclamations of “normal” from consensus healthcare. Normal is not the same word as healthy, which itself is not the same word as optimal. On Lp(a), optimal might be zero. One tsp. might not get to this level, but getting 3-to-3.6 grams of DHA+EPA per day from CLO raises risk of excess Vitamin A in addition to the toxin uptake concerns. Whole fish is the ideal way to get ω3, if it’s a lower-food-chain fish (as another reader pointed out), and if (as you allude) you have some confidence that it’s truly wild-caught, and not off-shore-farmed, which are fed grain-based CAFO garbage that drives down ω3, raises ω6LA and adds new toxin hazards. Three cans of sardines a day would do the trick, but that product is a minefield, due to packing fluid concerns, packaging concerns, and my observation that a can often does not contain a dozen or more nearly complete little fishies, but 6 or less chunks of some larger critters. I personally use two Sam’s Club fish oil products, one of which is also my Vitamin D source. The standard lipid panel is 40 or 50% informative. An advanced lipoprotein panel is much more useful. Here’s Dr. Davis on Friedewald. Now if we could just the high priests of the Cleveland Clinic to grasp that concept. You’d think that with the failure of CETP Inhibitors, and what appears to be the looming failure of PCSK9 Inhibitors*, that they’d figure out that just shoving markers around has no necessary correlation with actual outcomes. * PCSK9s may have some real benefit for those with Lp(a), and who are taking otherwise optimized nutritional steps, but we may never learn the full picture on that, and these agents may be withdrawn from the market, because the number of people with matching net-beneficial indications may be too small. – Thanks, I may check out the new book. – Yes, I likewise obtained my ApoE status from 23andMe SNPs. I’d further emphasize to the readers that there are MANY great benefits to 23andMe in mining personal health data. – Completely agree on the CAC. Or at least, the CAC score along with the context of its progression. Ivor Cummins covers this topic quite a bit. – Not sure on Lp(a), I plan to return to that topic soon after I get another test. I likewise don’t like “normal” ranges — but this applies in all directions (including advice from inside the LC community). For example, I’m less certain of smLDLp risk in a LCHF context given a number of factors. – Seafood hazards — Yeah, this is actually why I wish I lived on the coast. Getting prepared seafood in any manner carries the risks you detail. – CETP and PCSK9 make extremely obvious sense to my networking friends from a mechanistic standpoint. They are providing the most negatively impressive case of “scorecarding” medicine where you only care about modifying the number (LDL and HDL) rather than working within the system that governs it. This is a bit random & specific, but does anyone know anyplace around San Diego where one can get the CAC cheaply? I could def afford $100, but when I called around the local North County labs, I got a quote of $250 and another of $350, way out of my budget. When I asked my PCP for it, she wouldn’t do it, because she wasn’t concerned about my numbers (which I’m pretty sure is because they came down a bit after taking Bergamot for a few months, though my triglycerides remain way high and my LDL particles are way down, they’re still around 2,500). If mine came up 0, like Dave’s, I’d totally stop worrying about this, but at 55, everyone keeps telling me I should be worried. . .
I’m not sure which is worse, a PCP who things you’re going to keel over dead immediately, or one who thinks everything is fine and refuses reasonable tests. I talked to mine today and apparently I have the former. I guess she’s never seen a LMHR before. The impact of intensive lipid management, omega-3 fatty acid, and vitamin D3 supplementation on atherosclerotic plaque was assessed through serial computed tomography coronary calcium scoring (CCS). Low-density lipoprotein cholesterol reduction with statin therapy has not been shown to reduce or slow progression of serial CCS in several recent studies, casting doubt on the usefulness of this approach for tracking atherosclerotic progression. In an open-label study, 45 male and female subjects with CCS of ≥ 50 without symptoms of heart disease were treated with statin therapy, niacin, and omega-3 fatty acid supplementation to achieve low-density lipoprotein cholesterol and triglycerides ≤60 mg/dL; high-density lipoprotein ≥60 mg/dL; and vitamin D3 supplementation to achieve serum levels of ≥50 ng/mL 25(OH) vitamin D, in addition to diet advice. Lipid profiles of subjects were significantly changed as follows: total cholesterol −24%, low-density lipoprotein −41%; triglycerides −42%, high-density lipoprotein +19%, and mean serum 25(OH) vitamin D levels +83%. After a mean of 18 months, 20 subjects experienced decrease in CCS with mean change of −14.5% (range 0% to −64%); 22 subjects experienced no change or slow annual rate of CCS increase of +12% (range 1%-29%). Only 3 subjects experienced annual CCS progression exceeding 29% (44%-71%). Despite wide variation in response, substantial reduction of CCS was achieved in 44% of subjects and slowed plaque growth in 49% of the subjects applying a broad treatment program. My read of it is that he used fish oil and Vitamin D to accomplish the goal. The diet and meds were chosen to be SoC-compliant both to get IRB buy-in, and to minimize variables. I was given a copy of the paper some years ago by one of the authors, but didn’t keep any references for my interpretation of why they did what they did. In any event, Dr Davis’ current recommendations are clearly laid out in several books, web sites and blogs subsequent to that 2009 paper, most recently Undoctored, published just last week. All of it is based on actual results in his patient and subscriber populations. The diet is what I term enlightened ancestral: very low net carb, high specific fat, microbiome-attentive, specific micronutrient attentive (including D and fish oil) and thyroid optimizing. The fictional LDL-C is basically ignored now (actually measured small LDL particles are not). The Track Your Plaque recommended targets for conventional lipids (i.e., LDL, HDL, triglycerides) are LDL 60 mg/dl, HDL 60 mg/dl, and triglycerides 60 mg/dl: 60-60-60. Not only is this set of values easy to remember—60-60-60—but is grounded in science and the results of clinical trials. The LDL target is based on experiences such as that of the Reversal Trial, the PROVE-IT Trial, and the Asteroid Trial, all of which showed that LDL cholesterol values in the range of 60 mg/dl dramatically enhance the likelihood of stopping plaque growth or achieving regression, reducing risk of heart attack more than more lenient LDL targets. You might be new to this site and unfamiliar with my research. If confirmed, it will be very relevant for all prior clinical trial data. But before discussing that, can I confirm you’re already familiar with the Inversion Pattern I’m tracking? I had another thought after sending the previous post. I do see that your trig/HDL ratio is significantly better at your “sweet spot.” I’d love to see you discuss the balancing of different health markers. Yes, your “sweet spot” might improve the lipid markers but your insulin and glucose not so much. Which set of markers do you seek to optimize or how do you balance the various markers? Ah ha! See, you’re doing it too — you’re seeing the “Sweet Spot” and assessing it is “significantly better” — we don’t actually know that. Maybe it *appears* better, without actually being so. This is why it was a bit annoying to write this post as I knew I’d need to add another 500 words of qualifiers to every mention of a marker to make it clear the difference between a positive appearance and just… a reported number. The journey I’ve had with these patterns keep making it clear that many foundational assumptions with lipids and the biological network that governs it are very wrong. Thus, I’m not inclined to assume much of anything. It’s fascinating stuff. After a year on LCHF my total cholesterol was 294 with LDL 201. (HDL 79, trigs 69). My doctor offered me statins and without even thinking I just asked her “Are you kidding?” (She wasn’t.) It just seems so evident (as in there is actual real evidence here) that statins are dangerous and a waste of time/money for primary prevention. At least she took some articles to read. Sigh. I can see one use of this info to improve lipid profiles prior to a test so that your doctor would be happier. Heck, I can up the carbs for 3 days if I want to go that route. Many have done the protocol I wrote up a page where I detail how I did this. I think at last count I have had around 13 in the last eight months contact me to say they did it for this purpose. The carb increase from this last experiment is much newer and still very preliminary. And again, it only worked once past the threshold I was able to find. Thus, if this proved true to many, one could increase their carbs a certain amount and see no benefit because they hadn’t passed this threshold, to begin with. And again, this is all theoretical and speculative. What hours did you eat? Per the graphic above (http://cholesterolcode.com/wp-content/uploads/2017/05/swap_graphic.png), I ate at 11am, 3pm and 8pm each day. You are doing a fantastic job with these experiments, and the documentation. I haven’t read all of your post, but I will. Have you discovered the reason for this «hyperesponder» fenomena. I understand that apoE is involved. But the fat you eat is shuttled in chylomicrons, and surely this is not measured in your lipid tests ? The standard answer to why ldl-c raises in respons to fat is downregulating of the receptors. Can this really account for these big differences you observe ? Great Job Dave is doing. Jorn, the summary of Dave’s work is this: For the Keto adapted person, the Lipoproteins are in the main, energy distribution particles. The more fat you consume the less of it that you need. And the important factor is the body uses the sum of the last 3 day’s fat consumption to determine how much particles it should produce. For particle numbers, there is a two day delay for the three days used. More fat, less LDL is what the data is bearing out so far. This new insight says, you can still get ‘great lipid numbers’ for you Insurance Company by doing less fat and a little more carbs. Just that the Glucose starts coming up. Metformin? Yes, Chylomicrons aren’t measured as I always fast about 14 hours before a blood test, thus they should be almost entirely cleared from the system. Solomon’s comment summarizing my work is good. If you’re referring to what determines the higher LDL-C/-P in the first place (becoming a hyper-responder), that is still yet to be determined. Eating keto in a time restricted feeding seems the logical evidence based way. I may try testing that in isolation with regard to lipids at some point. Probably. We live in a heavily lawyered society now. But to be sure, I do encourage everyone to have a good relationship with their doctor. If you find you feel you know better than they do about nutrition and goals for your health, you should find another doctor rather than being compelled to lie or omit your lifestyle from them. I appreciate your work and feel lucky having you, thanks a lot. I am hyper-responder too. But I was doing intermittent fasting, like 20/4, 22/2 and have done 46-8 hours fasting few times. I was fast when had test and my cholesterol was really high ( 10.6= about 429). I was on low carb, high fat diet at the that time. So intermittent fasting and HFLC! I should have another test without being fast and see how fasting effects on my cholesterol. I am not worried about having high cholesterol after reading and watching your work. I believe so — but to be sure, I’m a good scientist and can’t say I know for certain one way or another. The one thing my data and research are clearly illustrating is just how much the lipid system is about energy distribution and maintenance. That cholesterol is actually a red herring in that it is just a passenger in the process, not a driver. Insulin represses the expression of the orexigenic peptides NPY and AGrP. By going into ketosis, I guess that the arcuate nucleus no longer gets the message via insulin that you’ve just eaten. You’d therefore produce more NPY than expected … and NPY increases VLDL-TG secretion by the liver. Taking some CHO would increase insulin, reduce NPY and reduce increases VLDL-TG secretion. I think this might be interesting, but I didn’t understand the acronyms. Can you say what is: NPY, VLDL-TG and CHO? Not what 9 hour period during the 5 to 10 day window but do you eat in 9 hour windows now? Does 3000 calories mean 1000 excess? What about maintenance? 135 grams of protein? Too much for me to maintain be and ketone levels. What about six months or more? Years? My day average is 180 fat and protein is 3 days of 66.25 grams and one of 12.5 grams along with 3 days of 30 grams carbs and one day of 50 grams. Two eating styles that might be interesting to compare all meat diet for years and or every other day eating. What are the blood results after years? Better worse same? How? – I believe I eat more in a 11-12 hour period normally. – Yes, I believe 2800-3000 calories while ketogenic to be my maintenance for weight stability. – re: protein — I genuinely crave fatty meats (particularly red meat) and have allowed for this as a major staple of my diet. Lots of steaks, burgers, etc. – Ketone levels aren’t as relevant to me as they are for most on a keto diet. – I plan to do a ZC (all meat) diet experiment at some point soon (summer or fall). I too am very interested in what the numbers will show. Why not forget entirely about cholesterol and focus on your Calcium (CAC) Score, that is scientifically proven to have a much more accurate correlation with cardiovascular disease? I’m a hiper responder who chose to go all in in keto, without looking back. CAC score: zero! Because this research is not only important for Dave, but for all of us. Finding out the truth about the lipid system and its connection (or lack of connection) to heart health is vital if we want to see a change in the current dietary advice and health care. Yes, Kanel — it’s certainly a major driving force for me personally! I hope to make a small contribution in the understanding of this system, particularly as it seems so much clearer from an engineer’s point of view. Indeed, it really does have so many things in common with a network that make it easy to test against. I focus on my CAC as well and likewise agree it is probably a far better predictor. Note throughout my article I use words like “presumably better” and “appears” rather than “is” for lipid test results. I’m emphasizing how the test scores look by conventional standards as opposed to whether or not they are indeed *actually* better. Which is why I emphasize in the What This Means section at the end that little has changed for me with regard to assessing risk. Dave…I just watched Ivor Cummins video on cholesterol and CAC testing. I am pleased to see you have done a CAC in conjunction with your research on the lipid system. For us regular folk, Ivor seems to suggest what Alberto says. Bypass all this lipid panel stuff, and go straight to CAC for CVD risk assessment. To our surprise and joy, the concept of “walk-in” CAC clinics already exists. We have been KETO for 5.5 months, but we’re otherwise healthy adults prior…we were on the low-fat bandwagon. Due to other issues, I have had a number of tests done, including carotid artery sonograms and a esophageal heart sonogram. No red flags, but they said I had some plaque. Here is my question – do you believe low-carb/KETO can reverse a non-zero CAC scan? Or, does KETO arrest a CAC score? In all likelihood, we will be doing multiple CAC scans in the forthcoming months, to see if there is a trend. Seems to me the CAC scan approach to CVD risk assessment and carb v. KETO dieting is begging for a study!! – It’s still too early to say what consistent Keto will do for CAC. I’ve met a few people who insist they’ve been reducing their calcium while being on the diet, but I haven’t really researched into it too much as there’s not a lot of sample size to work with. – Be cautious on how frequently you do CAC scans as they will expose you to progressive radiation, of course (mSv). I did happen to get one more a month ago and it was 0. Were it in the 100s, I’d probably check every 2 years. Ok, good to know on frequency. We will be lining up our first CAC within a week, hopefully. And will follow your advice on frequency. I hadn’t considered your points you made. Have you measured your CIMT Carotid Intima Media Thickness? Sitosterolemia was one possible diagnosis given for high plant sterol absorption leading to very high cholesterol numbers. – No on the sterol absorption, but I intend to get that tested as well. TC from 147 to 407 and LDL(C) from 73 to 317. I am also intermittent fasting in order to lose weight. I have not read all the blogs, but combined with your Breckenridge video, I have a basic understanding of the interactions. Btw, 13 years ago at age 57 I had a CAC score of zero and last month it was at 55 which puts me in the 14th percentile, so with a family history of atherosclerosis, I feel I am not doing too bad. Next up, I will be looking to get an NMR lipids test. I’m very glad you got your CAC score early into the ketogenic diet so you can chart progression. Congrats on keeping it so low for your age. Although a statin proponent would likely say this was the result of your being on atorvastatin this entire time and that it would have been worse if you hadn’t been. So like me, you are potentially heading into unknown territory to see if dropping off the statin results in a different outcome. As I always say, *please* share back the data whether good or bad! That said, you may already know there are many studies now that confirm all cause mortality is *lower* with higher cholesterol in the elderly population. Which is why I’m genuinely glad my dad’s cholesterol rose slightly on keto. 2 -There is no study that has shown that LDL is an independent risk factor if oxLDL is held constant. 3 – There are several forms of LDL – often classified as dense vs fluffy – the only way we know to change the type to the assumed more healthy form is to eat less carbs. 4- People losing weight will have higher LDL (transport out of adipose tissue). So having high LDL on low carb may only be temporary and represent a ‘good thing’. 1 – Agreed! In fact, the Response to Injury model continues to make the most sense to me with regard to existing evidence. Not that it is the *only* possible pathway to atherogenesis, but I’m inclined to believe it is the most predominant. 3 – This one is a little more complicated. I’m actually less certain that small LDL-P is independently atherogenic relative to larger lipoproteins because I think it more often reflects a diseased state in rare circumstances. I’m finding much more highly active keto athletes with smLDLp which makes sense given higher TG depletion due to greater energy demands. So mechanistically, this makes sense as a different reason leading to the same result. In other words, I believe where it associated some margin of detriment in the previous studies was due to a higher likelihood of disease state in subjects (bad reason for it). But in a new paradigm with keto athletes needing the TG for fuel and thus higher depletion from LDLp means smaller size makes for a good reason. Again, all that matters is whether it is, in fact, a *causal* agent. (And I’m guessing you, like me, are hard pressed to believe that without more substantial evidence). 4 – Agreed. Although given my research so far, it looks like that amount of weight drop has to be pretty high to yield a sizable margin. 5 – Yes — I’ve actually seen that one. Thanks for the link. Great links, Karl — thanks. To be sure, I try to be a good scientist and keep open-minded about possible alternate explanations at all times. But as always, the burden is on the one who asserts the argument (this includes me) for a theory. Yet I find in modern medicine there are a number of “givens” that seem to be presumed true, putting the burden of proof on the skeptic of this assumption. This certainly applies to the area of cholesterol. Prior to these latest tests you did your fasting experiment 21 -23 March. Fasting is known to increase serum total cholesterol and LDL and the cause is most likely the increased lipolysis that occurs during fasting. After you stopped fasting lipolysis would have slowed down, especially once you increased your food intake to 3000 kcals per day. No surprise therefore that your LDL dropped. – First, ALWAYS test my open-mindedness. I welcome all counter views here, especially if they are in stark contradiction to my own. I proactively watch/read vegans, other dieter commentary, and yes, even mainstream medicine counters to LCHF for this very reason. – Second, I think we were already on the same page. My theory behind the Inversion Pattern has always been mobilizing of energy via VLDLs in the absence of available incoming energy from the gut (Chylomicrons). And since the cholesterol in a blood test is picking up almost entirely VLDL-originating particles (Apo100), it will seem to go down when eating a lot and up when not eating a lot (and in this case, WAY up when not eating anything at all, as I predicted). Great post. An experiment eating ‘gluten free’ would be very interesting. I am high fat low carb without gluten. My LDL was 190 at the last count. I have cut down to one egg for breakfast instead of two. And using less meat fat. To try and bring this down. Though 190 doesn’t look too bad, compared with your 270. I should add that I am 65, nearly 6foot tall and weigh only 70.2 kilos. I am HFLC without gluten to keep my brain working. Very, very interesting. I’ll be citing it in a post soon. Hey Dave, Just wanted to post my test results on a whole foods plant based diet (HCLF). Again, i haven’t been as precise as you’ve been in weighing/measuring food but here’s what my diet (kinda) looked like. – Lunch/Dinner Option 1: Salad Bowl consisting of ~ 80 gms spinach, 1 mango, 3-4 spoons hemp protein, 2 hand-full’s of berries, 1/2 cup granola. This report looks quite good to me(apart from the low HDL). I am surprised to see this (low) value for trigs! I’d also like to add that i think i have lost some muscle mass in the last month. So in that sense, preserving muscle while losing fat and general overall well being, i would put the ketogenic diet as superior to what i am doing right now. However, unfortunately my cholesterol seriously go for a toss on HighFatLowCarb. Going forward i might try adding fat gradually and see where these numbers go. Since, i am at the other side of the spectrum right now (HCLF) i’ll probably start adding fat gradually while lowering carbs. I did briefly go through your latest post on adding carbs (will read it in more detail soon). I must say, i had tried adding some carbs (maybe around 50gms) while i was doing LCHF but that didn’t seem to bring down the numbers. Maybe adding more carbs would have helped! If you’re trying to boost your HDL-C while staying plant-based, I’d recommend shooting for coconut oil. There are several salad dressings you can make with it and it’s pretty easy to use in many cooking recipes. Of course, I’m not a nutritionist, but HDL-C is one of those that I watch very closely and it definitely seems to be impacted quite a bit by my saturated fat intake. Thanks for the recommendation. Like in your case, i too have noticed HDL-C most impacted by saturated fat. To be honest, its going to be hard for me to stay vegetarian long term. I’m going to try to add fish to the mix and maybe evolve this into some kind of Mediterranean diet. In any-case, at every step i’ll keep testing to check if theres anything thats making my numbers shoot up radically! – I’m curious — why do you feel it would be hard to remain vegetarian long term? I ask because I occasionally have vegetarians/vegans ask about going LCHF and would like to learn more about the challenges/benefits. I think that was overall to do with how i feel currently. Primary reason I started the ketogenic diet was to improve body composition and even though the lipids have improved, that aspect seems to have worsened drastically. Also, being vegan i find it hard to intake sufficient protein (there’s a limit to how much hemp protein one can have :)). Given this situation i am pretty sure i might give some variation of an LC another shot. I can understand vegetarian attempting LC but would believe LC on vegan would be hard. Curious to see how someone would pull it off without even the use of dairy products! Hi Dave – New here, but great blog (Thanks, Allan!). Your inversion factor is interesting. I’d love to see similar labwork on people who follow other dietary patterns, SAD, WAPF, Med, etc. I recently did an Indiegogo project to raise money to test resistant starches and I had enough left over to get more people involved in an n=10 blood glucose experiment (see at potato hack.com). Maybe you could raise funds the same way…very easy to do. My only quibble with some of your experiments is that the gut flora of a keto-adapted dieter vs a carb/fiber eater would be quite different, and a couple days of eating bread would not change the gut flora significantly. Perhaps a future experiment would involve a high-fiber arm with a timeline that allows changes in gut flora, ie. 6-8 weeks on higher carb/fiber. There’s a long history of studies showing large and lasting reductions in LDL-C without reducing HDL-C or increasing triglycerides over long treatment periods. If nothing else, your recent experiments show the meaningless-ness of a single blood draw. I’m always disheartened to see doctors who prescribe (statins, bp lowering meds, diabetes meds…) based on just one or two lab results. – Your website and project look great — good work! – Sure, I’m hopeful I can crowdfund the study I’d like to do. But I know it will be a challenge as most successful CF campaigns provide a product or event. And of course, my product is data… it’s a little tougher sell, but I’m still optimistic. – Oh yes, I’d love to see comparisons with gut flora and I likewise agree it would take a decent stretch of time. Part of my problem is how serious I am about controlling for variables. Thus far I’ve not had any experiment exceed two weeks, so I’d want to be sure I could carry it through all traveling, engagements, etc. – Yes — my research/data should really discourage *anyone* from overreacting to a single test. She explains how low insulin level can cause elevated LDL in some people so it could help explain how you hit your “sweet spot” by increasing the insulin a little. One thought that bothers me about all this is – basically every single marker of metabolic disease improves when going on a ketogenic diet so then why would the body decide to put you at higher risk of heart disease in the process? It does not make any sense to me. Oh yes — in fact I was physically there to watch Sarah’s presentation and it was the first time we met and discussed my research. I’m still in regular contact with her and we’re discussing some exciting new possibilities ahead. – Yes, your bothersome thought is mine as well, of course. Mostly, as an engineer who marvels at the genius of the human body in its many overlapping, regulatory systems, I’m still perplexed as to why the assumption falls on it commonly making the very thing that would poisons it. Love your approach, Dave. I also re-added some carbs after hitting a TC of 400 with regular fasts and keto-like carb intake. Some insulin seems to lower LDL. Discoveded it via Chris Masterjohn, who wrote a lot on this topic. .. in an insulin-sensitive person, carbohydrate stimulation of insulin has a powerful beneficial effect on LDL receptor activity. This doesnt answer the question if it’s an issue of course. Hey Manu, curious to know how much have you been able to reduce TC by adding carbs. About 20%, but I only did it for a short time by now. Maybe we are on the same page but I’m not sure because your theory doesn’t explain where the increased cholesterol has come from or where it goes to when the serum cholesterol decreases. My own hypothesis does explain this and it is nothing so very surprising. It is simply an effect of cholesterol exchange with adipose tissue, which has been amplified by changing patterns of food intake that have been switching lipolysis on and off, i.e. increasing fat consumption down regulates lipolysis or switches it off whereas decreasing fat consumption or fasting up-regulates or switches it back on. Furthermore I would expect this phenomenon to be further amplified in someone who is LCHF adapted due to their heightened metabolic flexibility. The connection with lipolysis comes about because adipose tissue is a reservoir of cholesterol as well as fat. The cholesterol is part of the fat cell structure and must get expelled along with free fatty acids during lipolysis. Your data in the period 21-23 March show serum LDL-C increasing at an average rate of 58mg/dL per day and during the period 23 March to 17April it is decreasing at an average rate of 34 mg/dL per day. It is instructive to derive corresponding cholesterol fluxes: At 79 kg and 1.9 meters your total blood volume must be around 5.7 liters and serum volume around 3.1 liters = 31 dL. Multiplying the observed rates of change of serum LDL-C concentration by the serum volume gives an estimate of the mass flux of cholesterol in and out of the serum, i.e. 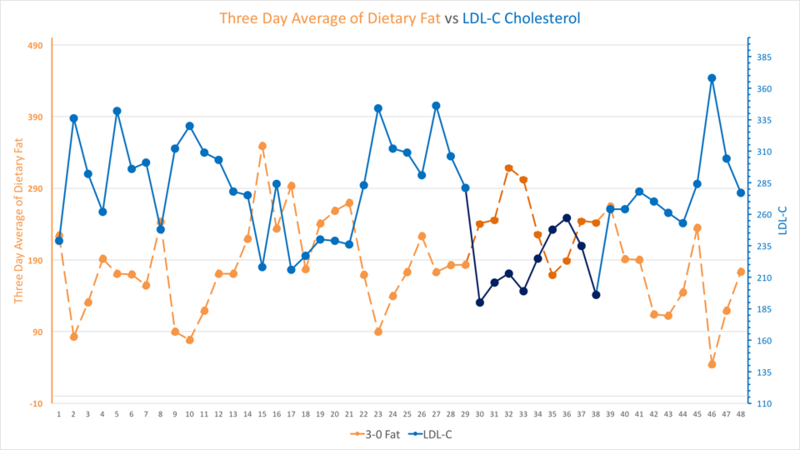 (Whilst the above is based on LDL-C measurements previous data from your twin diet experiment shows a very tight correlation between total cholesterol and LDL-C (R^2 = 0.991) so the rate of change of LDL-C can be used as a proxy for rates of change of total cholesterol). My hypothesis is that the ‘fasting’ rate of + 1.8 g/d is a net rate at which cholesterol is being released from adipose storage and that the ‘re-feeding’ rate of -1.1 g/d is a net rate at which cholesterol is transferred back to adipose storage. Note that the ratio of the magnitude of these rates is 1.6, i.e. transfer to storage is slower than release from storage. These estimates are consistent with measurements of total cholesterol turnover rates that were made around 40 years ago in 54 subjects – see references  and . Forward rates (release from storage) can reach 4.0 g/d and reverse rates (return to storage) can reach 2.5 g/d – interestingly the ratio of these rates is 1.6. With so many components in play it is not really surprising to see serum cholesterol responding dynamically but extra-vascular tissue exchange is the only component that might account for both the direction and magnitude of the dynamic changes, which your data reveal. Really fantastic numbers, Leigh. I’m a bit swamped this week so I can only give a quick comment, but I assure you I’ll be returning to this one as I’m intrigued by many of the elements you’ve broken out. You’re correct in that I’ve focused less on the origins of the cholesterol before being packaged into the VLDLs at the liver. But ultimately this is because I see the liver as a key staging-and-pacing regulator. In other words, I don’t think the liver is turning around the components of a VLDL just as quickly as it can process it, I think there’s process in place that determines the release — likely to meet target amounts of concentration in the bloodstream. This is where I tend to veer away from biochem thinkers who get focused on the lower level pathways as I’m eyeing the larger networking patterns. The tight correlation of the Inversion Pattern makes me skeptical that lipolysis activated by broad endocrine signaling just happens to keep providing that target concentration I see across the -C and -P markers with the liver as simply a throughput. Rather, I think the liver is very much a key regulator, and even more interesting, I think it relies on the network of lipoproteins for information feedback as well as distribution. I have some data to share and understand your perspective. In keto, my Trigs aren’t coming down. How can I share my excel with you? I’m particularly appreciative of what you’ve done and are proving, as surely many others are, particularly as “Jill’s Story” hits close to home for so many women. Being a woman is singled out in statistics as a “risk factor”, eg. CHADS VASC score for prescribing anticoagulation therapy. I’m aware you need experimental data, but you might be interested in the pattern appearing even with rough data. I’ve logged my food daily in Cronometer since August 2016, steadily, though not even close to your standards, to try out low carb for prediabetes. A pattern appears along the lines of what you’ve decided to prove. Nov 5, 6, 7 2016 – Avg Fat 145 grs. Jan 30, 31, Feb 1 – Avg Fat 210 grs. Apr 2,3,4 Avg Fat 151 grs. This pattern (that thanks to your work I now see) actually happened by chance as I started that second period after Nov 8 trying for lowish Net carbs (60-70 grs) and low cholesterol (max 300 mg) but as I’m way too thin and tall and started to lose weight, about half way through I just decided to ditch the low cholesterol attempt and continued on to my next blood test, eating all the fat I wanted. Dear Dave, I am at a loss for words as to the marvellous Pandora’s Box you’ve pried open. Would data from Cronometer and a future Blood Test mid-June be of any use to you? In the meantime, my sincerest appreciation for what you’ve accomplished. I may be following up with you regarding your data. I’ve gotten so swamped on so many fronts that my research with regard to other people’s labs/data has been a bit inhibited. But I’m hoping to open up more time this summer. In regards to your lipid panel of Feb. 2, I’m curious to know how you increased your fat intake from Jan.30-Feb. 1. Did you use saturated fat like butter and coconut oil? Did you add high fat foods like avocado? Sorry I didn’t answer before but I drop by occasionally and didn’t return to this post. 221.4 gr / 221.5 g / and 188.6 g.
I ate what Cronometer calls “Edwards, New York Style Cheesecake on 2 of those 3 days, accounting for 36.7 gr or 32% of the fat, and the other day Olive Oil 42 g, 38%. No coconut oil, and butter only 24 gr, on one day. Other items were for example: Raw Pecans, Macadamia Nuts, Walnuts, Avocado, Greek yogurt, Buffalo hamburgers, Fried eggs (2). Not sure that helps. Looking at the labs reported by tommy on his one meal a day and your 3 to 5 day switch on lipid blood levels then it seems reasonable to test five to ten days of one ketogenic meal a day. Indeed… it could yield some interesting results. At some point I might try doing a single meal a day myself as an experiment. I’ve dug up a few more clues from the literature – see references  and  below. Your combination of keto shake, bread and fat were probably a close emulation of the ‘casein + oligosaccharides + fatty meal’ experiment of reference . Any idea what type of protein was in your Keto shake? •	“The addition of oligosaccharides [i.e. carbohydrate] to a fatty meal suppresses the concentration of FFA due to increase of insulin but in addition chylomicrons and VLDL are delayed by effects of glucose and insulin on gastric emptying. •	Casein [i.e. protein] added to an oligosaccharide-containing fatty meal reduces the chylomicron response. Casein also markedly suppresses FFAs in the presence and absence of oligosaccharides in the fatty meal. • Casein [i.e. protein] added to an oligosaccharide-containing fatty meal reduces the chylomicron response. Casein also markedly suppresses FFAs in the presence and absence of oligosaccharides in the fatty meal. – Casein was part of my previous experiment with whole milk, but not so much this one with the intervention being bread. To whatever degree it would be present in the shake, it would have been so in the control period as well (which landed inside the inversion pattern). “Casein was part of my previous experiment with whole milk, but not so much this one with the intervention being bread. To whatever degree it would be present in the shake, it would have been so in the control period as well (which landed inside the inversion pattern)”. Bottom line is I think your keto shake + bread food mix was potently insulinotropic thus enhancing the inhibition of lypolisis thus reducing the recycle rate of FFA and production of VLDL, which in turn leads to reduced LDL-P.
Synergistic effect of essential amino acids and glucose upon insulin secretion in man. Floyd JC Jr, Fajans SS, Pek S, Thiffault CA, Knopf RF, Conn JW. – While true these studies are pointing to a higher association with regard to insulin boosting in combination with the glucose, I’d have expected a much higher fasting insulin. This would seem especially true given both (1) my super high postprandial and (2) my higher fasting glucose. To be sure, it’s hard to isolate the insulin-to-glucose pancreatic response ratio, but I’d expect the overall magnitude of these numbers to be substantially lower in the presence of higher insulin from a proportionality standpoint. I ate around 2500 calories per day (no shakes or bread, so numbers are not exact), with at least 100gr coming from carbs (up to 200gr one day). My saturated fat consumption was low (<25gr), but plenty of monosaturated fat (nuts, avocado and olive oil). I also took vit D (~5000IU) and fish oil (3gr of https://www.amazon.com/Ascenta-Health-Nutrasea-Omega-3-softgels/dp/B002GP08EK). Ratios in the 30-50-20 (carbs – fats – protein). So, reduction in both LDL-P and small LDL-P, but increase of triglycerides. I think I will try again in 2 weeks, but controlling a bit more the carbs around the 100gr mark, and with higher saturated fat consumption. Also doctor appointment, so I will ask for a calcium score. Thanks so much for this website and all you are doing to help all of the hyper-responders out there. I must admit that a lot of what I read is a bit over my head, so I appreciate that you always sum things up! I got the call to come back for a re-check so that is in a couple weeks. I plan on asking for an NMR this time and also for more of the tests that you recommend we get done. 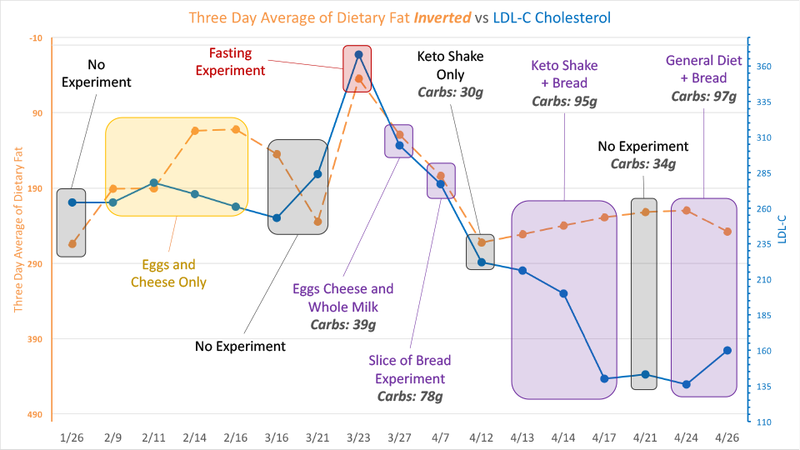 I was thinking about using your protocol of increasing my fat consumption for the 3 days prior to my test, but then I saw something on the Diet Doctor site that intrigued me. They have a page of advice for people whose LDL goes up on a Keto or Low carb diet. I have been drinking Bulletproof Coffee for years. I use about 2 TBS of grass fed butter and 1 TBS of MCT oil in 2 16 0z cups of coffee, not each cup, but the 2 cups. Is there a difference in the fact that I am drinking that fat rather than getting it from eating food with the fat, like eggs cooked in butter etc. ? I don’t recall reading or hearing on any podcasts of anyone who just stopped the BP coffee and their LDL was corrected. If I decided to give that a try, how long before my lipid panel should I stop the BP coffee? Right now I’m not sure which option to go with, lots of fat for 3 days, or no BP coffee for some amount of time. I’m not convinced at all that my elevated LDL is a problem, but I’d like to do some experimenting. I’d appreciate any advice from you or the community here. – I’m not that familiar with the “drinking fat” connection with regard to cholesterol. Mechanistically, I’m skeptical as to how much this would matter given the process of emulsifying and absorbing the fat must necessarily be the same (enterocytes > lymphatic system > bloodstream as chylomicrons). But to be sure, I can’t say I have done much experimenting in this area (plus I don’t drink coffee). There is one recent reader here who accidentally had BPC during the morning before his blood test and we are both wondering if this might have spiked his numbers — but to be sure, I’m fairly sure this is more likely about the fasting/timing than the BPC itself. You might want to consider both dropping off the BPC and doing the protocol. The one obvious downside is that you won’t know for sure if the BPC switch made a difference. Thanks Dave. My labs are in a couple weeks, I’ll let you know how they turn out. Deb, Did you decide to reduce your drinking of fats or make any other change prior to your labs and if so do you care to share your results? It’s interesting how we can easily interpret information differently person to person. My understanding of the Diet Doctor recommendation to eliminate Bulletproof coffee or other liquid fats is not that it’s the act of drinking them that is problematic but that they are just added dietary fats and for some people this may be too much and the fats within our protein sources may be just enough. I came to this understanding/conclusion from a combination of sources, not just Diet Doc. We are in a similar boat. I’m also a hyper responder and most of this is way over my head as I try to catch up. I should’ve been an engineer. I’ve decided to greatly reduce and almost eliminate the added fats in the form of bulletproof coffee and heavy cream in my coffee. It’ll be interesting to see and compare the resulting numbers to my previous numbers while Keto. I’m fascinated by this subject because…. have a very low insulin score (4), and am lean and insulin-sensitive by all measures. I also have high LDL (200), high total (300), fairly high HDL (78), and low trig (78). My oxidized LDL (measured for the first time recently) is extremely high (116). My LDL particle count is 2400 and my SD-LDL particle count is 949. I’d like to get the unfavorable numbers, particularly the oxidized LDL, down considerably. If I’m reading the transcript of that Masterjohn episode correctly, and reading your article correctly, someone with those stats should not be eating keto LCHF with sometimes only two meals/day, but rather should be eating three meals/day with lower sat-fat and higher(ish) clean carbs, like lentils or sweet potatoes in the 100g/day range, and loads of antioxidant vegetables and spices. The greater carb load will trigger an insulin response that the insulin-sensitive person can handle, and that insulin response will activate LDL receptor sites which will clear LDL from the bloodstream before it can oxidize. Do I have that right? Do you diverge from Masterjohn at all with respect to this theory? Let me know. I’m highly invested in this issue at the moment. – Can you tell me where you got your oxLDL score, and that lab’s reference range for this marker? – With regard to your other markers, you fit right inside the lean and/or athletic LCHFer, for what it is worth. This is a pattern I’ve both seen and remarked on many times. I’m not as concerned as most (even inside LC community) with regard to small LDLp due to it making mechanistic sense with regard to your context. In fact, I believe it’s very possible the body is doing some amount of compensating for lack of glycogen it detects by keeping higher TG availability in circulation. And the more you are actively depleting that supply right off the LDLp, necessarily the smaller it will get (LDLp shrinks as it loses its cargo). I can never emphasize this enough times: the lipid system is first and foremost an energy distribution network. It has many other jobs as well, but the energy should be the key context that is always thought of first. – With the above said, this may be an answer to “why” you and I have higher LDLp (and thus, higher circulating LDLc onboard), it isn’t necessarily an answer to whether it is a net increase of risk. Obviously, given I take no steps to lower my cholesterol, I’m on the skeptical side. But likewise, I like to emphasize this opinion could change with the data. Ah – I hadn’t heard of that one. I’ll have to look into it. I find it interesting that Chris Masterjohn explains how LDL-C can spike in an insulin sensitive person who goes on a Low Carb diet (this has been my experience on Keto) but how do you explain the many very insulin resistant people who see the same thing ? Thank you for taking the time and all the needles to do this. I switched to a LCHF diet back in September from a HC-LF diet I was on for almost two years. I lost around 20lbs since then and I’m currently 165lbs at 5′ 10″. Overall I look and feel better than I ever have but my LDL-C has doubled since the switch which has prompted my doctor to tell me to stop the LCHF diet. From what I’ve read of your experiment your suggesting a moderate amount of carbs has allowed you to drop your LDL levels. I’m thinking about trying this as well to see if I can have the best of both worlds by reaching that sweet spot. My idea is to drop my saturated fat intake from 67 grams per day down to 32 grams per day by switching from coconut oil and grass fed butter to olive oil instead. I’m also going to switch regular sausage for turkey sausage to cut down on sats, but I will keep in cheeses and red meat. To replace the lost calories I plan to add approximately 100 grams of carbs (per your experiment) in the form of mixed fruit, brown rice, and gold potatoes (breads/pastas tend to make me feel sluggish, so I’m avoiding those). Just wanted to check with you if this sounds about right? Also how long do you think I should wait before getting blood work redone? First — the last experiment is very preliminary. So take with a grain of salt for the moment. Plus, if true that this is a “threshold” point mechanism, then it means you could be disappointed when/if being on the other side of it after making changes. Second — it’s worth noting that following that experiment I’ve been back to full keto knowing full well it would return my lipid numbers to the hyper-responder degrees. I’m not yet convinced making my lipid profile numbers “better looking” is indeed a lower all-cause risk. But to be sure, there’s a whole lot more research to do before I can have a stronger opinion on that. All that said, I know there are many HRs would just prefer to have the choice to do so, even if it knocks them out of ketosis, adds more insulin, etc. And in that regard, I hope my current experiment may help with at least staying low carb if not ketogenic — if the theory behind it proves to have merit. My son is APOE E4/E4, we emailed in the past and I am looking forward for your research. I wonder if you monitor the point where you go to keto, could be that the step in the graph is you system going into keto ? I was taking my BHB each morning, so I’m confident that — at least numerically — I was definitely out of ketosis with readings of 0.1-0.2 mmol/l. When I get some time, I’ll see if I can go back to the other experiments with higher carbs (whole milk and single slice) to see what those BHB readings were. They are currently in photo form, but not yet moved over to the spreadsheet. You’ll be interested to know that I’ll be reproducing this experiment soon, but changing up the single keto ingredient to fatty burger patties and using a different form of carbs (yet to be decided). I’ll also have some new toys to track this with and I’ll be keeping a sharp eye on BHB as well. Great work! I can’t help but notice that your sweet spot tipping point was right at the keto/no-keto level of carbs. Did you plot LDL v ketones? Personally, I’m following this even more closely after I got my first blood test after 3 months on Keto. I happened to have had a 36-hour fast in the measurement window – which probably “worsened” these numbers. – Your lipid panel falls right in line with the pattern I’m seeing for lean and/or athletic low carbers — is that correct? – Remember, if you do the protocol, you don’t want to be “non-fasting retest” — you still want to fast for 12-14 hours from the last meal on the evening before to the blood draw in the morning after. Right on both counts! I’m 6’4″ 150lb and training for a marathon with ~25 miles + 1-2 cross trains per week. Exactly right on the fasting. Last time I both fasted too long 2 days before, and not long enough the day of. I’ll fix both of those and report back. Great! I look forward to seeing your data! I am fascinated by your experiments. I am hypothyroid (Hashi’s) and get bloodwork every 4 months. I’ve been eating very low carb for years, and my LDL was too high on my last test (HDL is high;trigs are low). My doctors don’t see a problem but ‘make noises’ about the LDL. At the time of the last test, I was eating a lot of Kerrygold butter, and I thought that might be the problem. I’ve since reduced intake significantly using olive oil instead. I have a test scheduled for next week, and I was thinking of trying your ‘carb solution.’ But then I wouldn’t know if it had just been the butter. ‘masking’ Type 2 diabetes (all my siblings have it), but she warned me that I needed to prepare for the test by eating at least 150g carbs for 3 days–or results would be inaccurate. I wonder if there’s a similar shift with LDL. That’s very interesting… For what it’s worth, I don’t think changing out the butter for olive oil would be that significant a shift in your lipids. But I *do* think swapping out fat for carbs likely would. 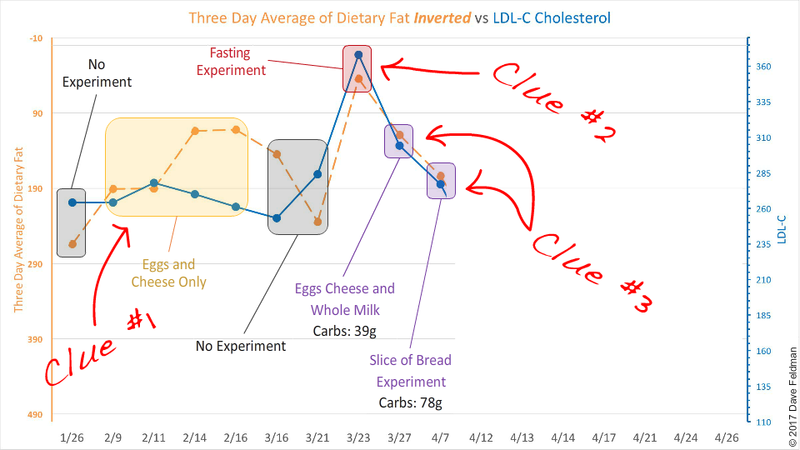 – I’ve never heard low carb “masking” T2D. Unless by that she means “functionally cured”. I started keto originally for the purpose of dodging T2D, which is very prevalent on the one side of the family. And sure enough, I have super low fasting insulin, so I consider it a pretty obvious solution. I’m trying to decipher the concept of eating LCHF leading to higher utilization of Triglyceride for energy, alongside the typical drop/lowering in Triglycerides on a lipid panel. Would it be the equivalent of more people being interested in taking a cruise (Trigs for energy demand), so more cruises are being scheduled more frequently (increased LDL-p), even though each ship is taking fewer total passengers (lower Trig levels)? So, even with less passengers per ship (low Trigs), the cruise ships just happen to maintain a high level of life boats (LDL-c), just in case those life boats are needed? Thanks for your input and efforts. To expand on the cruise ship analogy, imagine people could either sail their own boat to a destination (glucose) or ride with other passengers (trigs) to the location in a cruise ship (LDLp). Thus, glucose rides alone as a single molecule. Trigs ride in a massive group in a single LDLp (a BIG one), which ride shares with a small payload of cholesterol and fat soluble vitamins as well (*all* the passengers are lipids). Going low carb means less of your energy is taking small, individual boats and instead grouping together in these large cruise ships. But likewise, more of these passengers are getting off at various destinations (less trigs, yet more LDLp, and thus more left over LDL cholesterol inside). Again, even if you have more LDL particles (boats) needed to transport more trigs (passengers), if the *usage* of the trigs are higher then the newly expanded amount, you will necessarily have lower overall trigs than before. Yes, the endo thought that my very low carb eating might have been ‘controlling’ Type 2–i.e., I was getting normal blood sugars by restricting carbs (I typically eat <20g). The GTT was negative–i.e., no diabetes. I definitely plan to do low fat/increase carbs for three days next week prior to my blood draw. I'm aiming for 150g, mainly from rice and beans and some gluten-free bread (I have Hashimoto's and avoid gluten). I'll post my results. That’s great! Please come back and share the data, however it comes out. Are all the results above, all the testing, with no other changes in stress levels, sleep habits, movement, exercise, social interaction, sunlight? I’d say a *qualified* yes. When you ask an engineer something so categorical, we have to think literally of course. So sure, there’s probably a deviation of maybe 10-20% on a day-to-day with stress, sleep, movement and sunlight as I had fairly locked routines over that period. With regards to social interaction, I have no clue as that can vary a lot. But I’m confident the majority of it was online or with my wife during that stretch. I had great success with this protocol. My doctor took a wait-and-see approach, and gave me two months to try lifestyle changes, then re-test. This time he ordered the NMR lipoprofile. For four days before the blood draw I ate my usual keto food, minus added fat, plus about 100g carbs/day (mostly bread). I don’t know exactly how to interpret the NMR results, but they don’t look bad to me. Thanks for the inspiration to try this. That’s fantastic, Thomas — thanks for coming back and sharing the data! You’re technically the first to have done this after me and reported it back. I’m going to tweet this comment out in full. TC 168, HDL 50, and LDL-C of 101 would be considered great in most doctors’ offices. LDL-P 1011 – they consider <1000 "optimal" but most males on SAD typically fall around 1300 anyway. Small LDL-P 402 - they consider <500 "optimal"
So in short, I think your NMR looks fine. Bear in mind the LDL-P would likely go up were you having fewer carbs, but whether that’s a risk is certainly debatable (and you know where I land on that). I would love to see this experiment done with alcohol instead of carbs. I am curious to know if there might be a similar threshold. I’m likewise interested. However, I’m actually not a drinker, so I may need another aspiring N=1 to bring that data in for us. I may have to volunteer myself. I’m looking at ~4 drinks per day and about 400 kcal of alcohol per day. A bit on the high side, but definitely doable short term for the sake of science. Thank you so useful.I’m not alone. I will keep watching and cheering you on. Could carb loading upset the fat loading apple cart? Or could Moderate Net carbs 70 – 85 grs somehow be on the wrong side of the fence, not close enough to keto? I did my best and haven’t a clue as to what went wrong. “Nov 5, 6, 7 2016 – Avg Fat 145 grs. I had also seen something of a pattern with carb loading for a better FBG and HbA1C. I decided to Carb load because of that last FBG *and* do your 3 day high fat on the same 3, 4 days. I doubled Net carbs and Fats for 4 days before the Blood Test. Hope it makes sense and could prove useful. I really appreciate what you’re doing. A fascinating Pandora’s box, no doubt. Hi Ginny — this is great work! Jan 30, 31, Feb 1 2-Feb 210 ? ? 218 136 ? ? So this is four experiments in all. The first and third ones you were lower fat than the second. Yet the first and third you have higher total and LDL cholesterol, with the second being low — thus, this would follow the Inversion Pattern, yes? In the fourth, you say you “failed” and I’m not sure with what you are referencing. If you mean by picking up the surplus fat and carbs it spiked your cholesterol as opposed to lowering it, I wouldn’t be surprised. In other words, if you want to try adding carbs, you’ll want to correspondingly reduce the fat on a calorie-to-calorie ratio to find out. That said, you’ve helped immensely by adding more data to this experiment in testing the reverse! Great work! So refreshing to be discussing these issues where “failures” or “mistakes” only require acknowledging that one merely didn’t understand the complexity involved and got caught up in yet another simplification. I noticed the “carb swap” reference but didn’t consider what that would mean in my own attempts to “beat the numbers”, a mistake in itself, but that’s the corner the MDs have pushed us “laypeople” into. That’s the “failure”, but, if you don’t know what you’re doing, you can hardly expect to get the “right” results, no? I copied the html table code, filled in missing data, I’ve not a clue if if it’ll paste right. I’ve been looking at my Cronometer data since August 2016 checking Macros and Calories, which I paid no attention to before, as I was trying to find a way to keep carbs down to a certain number of grams to see if I could bring my HbA1c out of the prediabetic range. I have 5 blood tests with data (Sept, Nov, Feb, Apr and June). I looked at the 6 days prior to each test, and took averages for the first 3 days and the second 3 days of those 6 days, considering Macros (%) and Calories (up or down). I’ve found that in only 3 series I (unknowingly) kept my ratios relatively similar from the first to the second 3 day periods. In the other 2, TC 289 and TC 319 and LDL 223, the drop in calories from the first 3 days to the second 3 days prior to blood tests was (-279) and (-271). Just wondering if at all useful. Yes. I’m helpless with numbers, Cronometer rounds them off. So yes, we see in the second row when you actually have the second highest calories, yet the high adherence to fat-based energy — you end up with the “best” lipid numbers. (I say “best” in quotes because I don’t know how much I believe these ranges anymore). But with the 4th you are at a higher energy load overall in both fat and carbs. Now — it’s worth applauding you in that you may have exposed exactly why this doesn’t work with the Standard American Diet. High Fat + High Carbs (or even moderate carbs) = High Glucose AND High Lipids. Great work. You are a typical engineer with such attention to detail and determination to find out WHY. I have done similar to with extensive testing of BG (including CGM) to achieve low BG readings (especially for yearly tests). Unfortunately the KETO + FASTING + EXERCISE to achieve low FPG has resulted in SUPER HIGH CHOLESTEROL of 538 with LDL of 441 and HDL of 58 at the last yearly test. GP was shocked and provided my risk score of near 40% chance of heart attack in next 10 years. From attending recent conference I learned about your incredible work and managed to have stay of execution from statins until after my next cholesterol test on Monday. Could you please help with a little more advice on menu details for the 5000 calories I will be consuming on Friday to Sunday, for example Breakfast how many eggs and bacon, Diner what weight of steak and veg etc. It worked! And I was totally shocked because I really didn’t think it would. What’s amazing is that it ONLY affected the LDL and kept my great HDL and trigs as they are. What I did: I normally eat <20g carbs a day (closer to <10), so for 3 days prior to my blood draw, I ate 150g of carbs, which is what's recommended when preparing for a GTT, so I thought it might be a similar metabolic principle. I ate brown rice, beans, brussels sprouts, and some gluten-free bread and counted my carbs careful. I made sure to fast between 12-13 hours before the draw, which meant eating later in the evening than I usually do. saw no problem with this. So it's possible this isn't a 'hack' but a way to arrive at more accurate numbers. – Fantastic! So glad it worked and you’ve added another N! – Not sure we know yet whether the numbers are “more accurate” per se. But we *do* know how agile and dynamic they are, that’s well confirmed. I want to add that for my next blood draw 4 months later–I did something similar that did NOT work. I went low fat, but I added carbs without counting–probably in the 200-250g range, and my LDL was high again! So there may be a ‘sweet spot’ for me that’s at 150g, which is what I used the first time with success. I have another test due in March and will try again with 150g to see if I get the same (good) result. I certainly don’t want to do low fat eating as a regular dietary plan because I seem to thrive on the carnivore diet with just meat, fish, and fats–and the fats are important. Yes — this is why I REALLY emphasize “Swapping” instead of “Adding”! My current phase of research is a lot harder because I’m experimenting in this area and there’s a tipping point toward the other direction. If you carb up enough in total surplus, your LDLc/p will rise in response. Great work as usual! I’ve been a hyper-responder with my total cholesterol around 260-280 in the past. For those blood draws, I was eating typical keto and trying to gain some weight with weight-lifting. However, I just had a blood draw while now cutting back on fat/calorie intake (still very low carb) to try and lose a little weight and continuing to weight-lift, and it came back with my total cholesterol over 500! I’m going to try having around 100 grams of carbs a day, and I’ll let you know how my results change. Not that I think high cholesterol is a problem (although 500 is starting to get concerning), but I think it’ll be interesting to see the results even though it’s confounded with exercise. I just tried the experiment for the past month. I calculated 100 carbs per day but just got me latest cholesterol test back and my LDL is still off the charts. Not sure what to do now, increase the carbs more or just go back to eating Keto. What do you suggest? Can you post a bit more detail? What were your previous tests (Total, LDL, HDL, and triglycerides), and what did you eat in the days before them? What were the new tests (Total, LDL, HDL, and triglycerides), and what did you eat in the days before? However trigs and HDL have improved markedly! Where would you go from here – more carbs? Maybe I’ve not hit my ‘sweet spot’ yet? I’m a hyper-responder. Starter Keto diet in Sept 2015. Body fat for these labs has been between 10 -13% (currently 12.5%). I’m going to try the LDL drop with a followup NMR test soon. I’ve tracked every meal in myfitnesspal for the last 1880 days so if you’d like to take a more detailed look at my meals for data collection purposes or to recommend a target carb level pre test…email me. – If I may ask, do you do a lot of weight/resistance training? – I may follow up with you on that diet data, but I’m a bit slammed lately with a number of responsibilities and haven’t been getting as much Spreadsheet Time these days. Thanks for the response…I know you’ve been busy with the recent study, travel and all. Yeah, I posted in the wrong section. Should have put this under the hyper-responder post..I started doing body weight resistance training about a year ago…pullups, pushups, jungle gym xt exercises, etc. Prior to that I was walking a lot (fitbit). 10-13k per day…I cut back on the walking after reading body by fitness…mostly now doing resistance to failure once a week. I have my nmr lipid blood draw scheduled for Monday morning…actually bought some bread for the three day prior deal…been a while. I am going to add in 500 cals of bread and eat some steaks this weekend. Let me know if you see this and there is anything you want me to try otherwise. I’m up for some n equals 1. Well that didn’t work out too well. My LDL increased after the bread drop. Total dropped though. Although I only averaged around 3500 cal for the three days before…couldn’t scarf down anymore. Also, the previous was llisted as >350…apparently unable to calculate it above that…whereas the post bread drop was an NMR so I suppose the 375 could actually have been a drop from the >350. Rusty, I think you may have conflated the breakthrough experiment (in this post) and the “extreme drop protocol” (from the menu above). 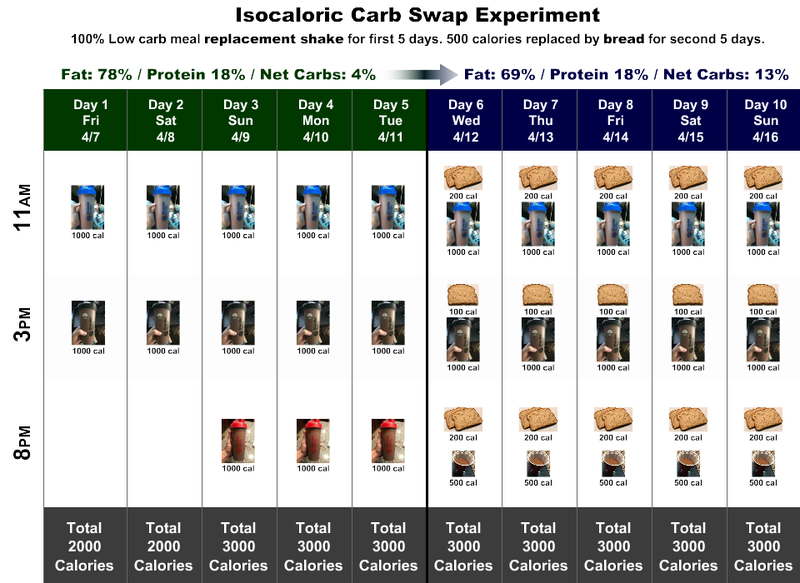 This breakthrough experiment was an isocaloric carb swap. As in, I was testing what exactly 3000 calories on keto would yield on a cholesterol test (1) and comparing it to 3000 calories on keto — but swapping out 500 cals of keto for 500 cals of bread. Thus, there’s effectively no net increase in dietary energy. The extreme drop experiment *is* an increase in dietary energy, but only on a ketogenic/LCHF ratio — which is to say, you are *not* supposed to bring up the carbs. I wouldn’t be surprised at all if one were to bring up both fat *and* carbs that they’d get a much higher cholesterol score (and likely TG too).